So what does make me happy this time of year? In a word, citrus. 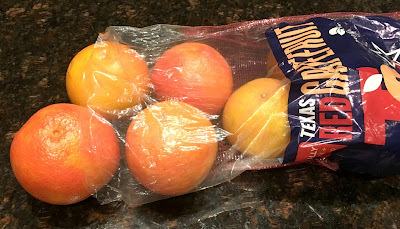 Late fall and early winter is citrus season, when oranges are orangier and limes and lemons are juicier, and Texas Red grapefruits make their annual appearance in my local Chicago grocery store. As I mentioned when I first wrote about them in this 2009 post, the two things that I miss the most since moving away from Texas are Ruby Red grapefruit and the Pecos Cantaloupe. I still haven't found the cantaloupe, but every November the grapefruit shows up at Jewel. Apparently I am not the only one who feels that way about these deep red, sweet gems. The 73rd Texas State Legislature declared it to be the State Fruit in 1993. That is a resolution I can get behind! Since my move this summer I have been thrown off kilter from my normal routines, and seeing all kinds of things from a new perspective. The holidays and grapefruit have not been much on my mind, especially once I decided that I was not going to travel this year and instead spend time working on my apartment and other things I have been neglecting since I moved (like this blog). So I wasn't really thinking about the usual things this fall. A few days ago I did have the fleeting thought that we were coming into citrus season, which made me happy because oranges are more plentiful and juicier this time of year, but that is as far as my thoughts went. So when I walked into Jewel Monday afternoon and this five-pound bag of Texas Reds was the first thing I saw, I think I actually squealed with delight. And threw it into my cart, of course. That five-pound bag of flour I was going to buy could wait until my next visit. I went home and immediately supremed a few of them and have been enjoying them all week. Unlike pink or white grapefruit, the reds are sweet with just a hint of tartness. I am not a big fan of the pink and white varieties but I absolutely love the reds. If you give them a try I think you will too. Many people find grapefruit to be more trouble than it is worth. I always supreme a few at a time and keep them in a container in the fridge so it is ready to eat when I want some. If you have never supremed citrus before, this post will show you how. So now you have no excuse not to enjoy these seasonal gems.